The Adept Oil NFT Nitrile Fully Coated Gloves are a patented NFT® fully coated glove with a flat nitrile undercoating to provide a flexible and waterproof glove with enhanced dexterity and exceptional grip in wet and oily conditions. The NFT® coating of the Adept Oil NFT Nitrile Fully Coated Gloves provides class leading abrasive resistance to offer an extremely long lasting glove and, with the Sanitized® hygiene function, is able to stay fresh and odour free throughout usage. 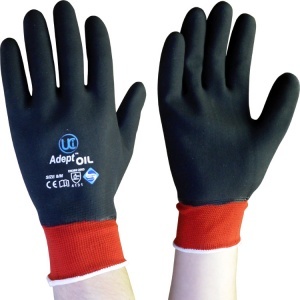 the Adept Oil NFT Nitrile Fully Coated Gloves is a specially engineered glove for use in particularly wet or oily conditions to keep hands dry and ensure maximum efficiency throughout usage.